Staying in the Majestic Taj Lake Palace Hotel in Udaipur had always been my dream. Recently I had the opportunity of enjoying the luxurious stay there. I have no words to describe the Royal welcome and hospitality extended to us during the stay. The food, specially the traditional Rajasthani dishes were awesome. Being a food blogger I appreciated the invitation of the chefs to prepare a dish of my choice from the hotel’s menu in the kitchen. Cooking with them was indeed a great experience for me. It is used only as dry spice .It lends pungency to a dish and also color and body. You may not find it in the stores outside Rajasthan but these days you can get it online. 1. Heat desi ghee in a pan and add the cumin seeds and whole spices. 2. When they give out the aroma, tip in the onions and saute until golden brown. 3. Add ginger garlic paste and saute. 4. Now add the chilli powder along with the salt and other spice powders and stir. 5. Add the chicken pieces and saute. Simmer it until the water dries up. 6. Add the tomato puree and cook further until the oil is separated. 7. Add the chicken stock or water and simmer until the chicken is done. 8. Garnish with chopped coriander leaves. I have bookmarked this yummy recipe. thank you so much for visiting and liking my space.. 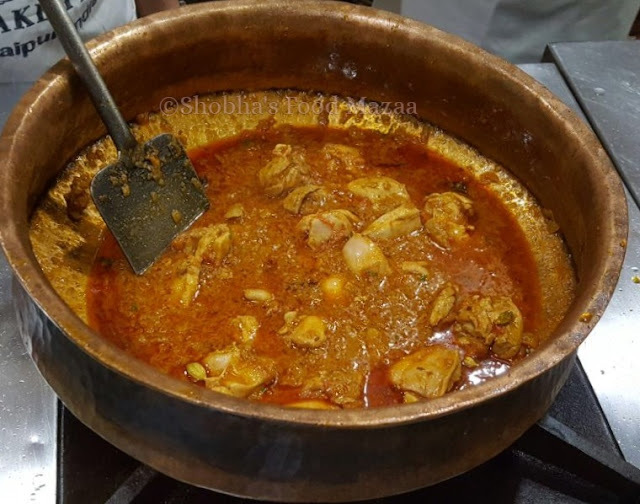 I am sure you will love this dish.. do share your feedback when you make it . I was in Udaipur recently but only saw the hotel from far. You are so lucky to have stayed there and had such a great opportunity to cook with the chef. Yes Nayna.. It was so much fun..
As I always say to you - You are a lucky lady!! How wonderful to stay at the beautiful hotel and get the opportunity to cook with them.